Thanksgiving has long been one of my all time favorite holidays. Its about food. Namely, cooking and eating a giant amazing meal. My little internal historian is forcing me to mention that the Pilgrims did not come to Massachusetts to escape religious persecution, they came for economic opportunities, like everyone else, and to avoid the Dutchification of their little group. Also, they were not the first European settlers in what is now the US (they weren’t even the first English, not to mention there were, you know, already millions of people living here). On the plus side, Lincoln made Thanksgiving a national holiday during the Civil War, so that makes it all better. Ok – now that that’s out of my system. For all intents and purposes, Thanksgiving is a standard harvest feast. Which, in my opinion, is awesome. Appetizers: Crackers and cheese. Simple, I know, but easy to snack on while everything is finishing cooking in the oven. I had two types of cheese, goat cheese brie and Irish cheddar, with some apple slices and a glass of Riesling. Basic winter salad of my own design. 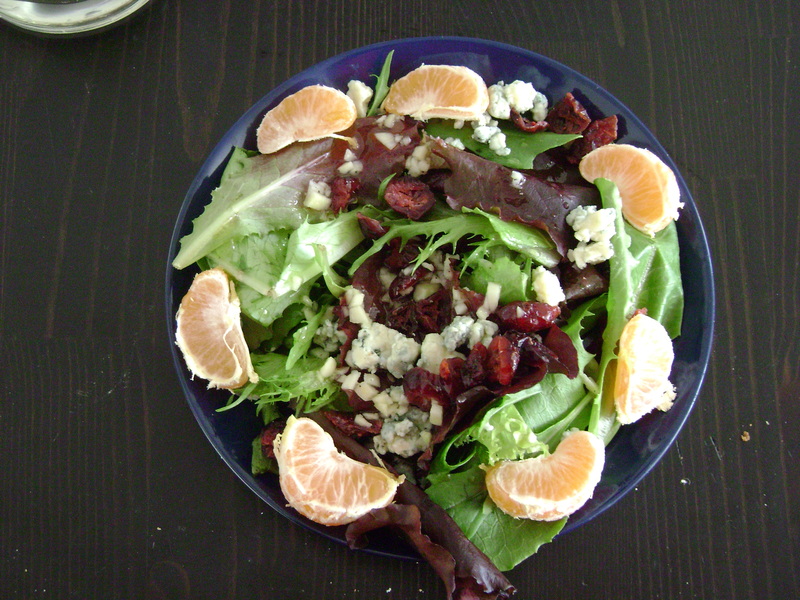 Spring lettuce mix, with crumbled gorgonzola cheese, dried cranberries, and little sections of tangerine. For the dressing, I simply chopped up some garlic, added salt, pepper, white wine vinegar, and olive oil, mixed them all together, and spooned it onto the salad. Served with a light white wine. One of the great things about working in the field of international relations, is that a number of my coworkers are from different countries, and everyone has traveled to interesting places. As a result, one day at lunch, one of my coworkers, who is from Georgia (the country, not the state) started talking about the different types of Georgian cheese breads – in particular one that was basically a bread boat filled with cheese mixed with egg. I was instantly enamored of the concept, and needed to make it for myself. Sadly, she was not able to give me a recipe, so it was left to the internet to teach me how to make it. 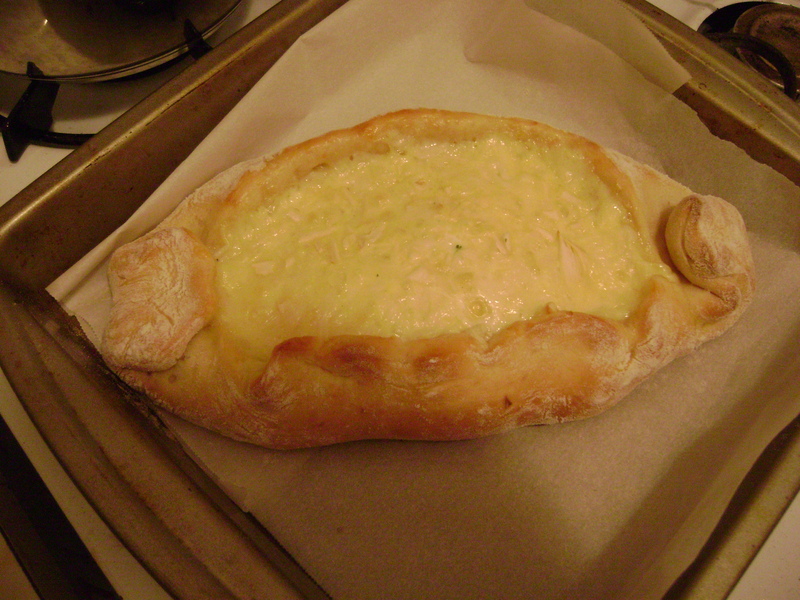 The recipe I found was this: Adjarian khachapuri. Since this was an experiment in foods that are incredibly bad for you, I decided to make only 1 cheese bread, and adjusted the recipe accordingly. Heat the milk and water together. Once it’s warm, add the yeast and a teaspoon of sugar. Let it sit for 5-10 minutes to give the yeast time to start bubbling. Then add the melted butter and an egg. Mix all the liquids with the flour. Knead until elastic, then let rise for and hour or two. Meanwhile, make the cheese filling. In theory, you are supposed to use some kind of Georgian cheese called sulguni. There was no way I was going to search around for it. So I used a combination of shredded mozzarella and goat gouda (which, for the record, is incredible stuff). Mix the shredded cheese with an egg. I also decided to add in a bunch of chopped garlic, cause why not? You can also add parsley, but I didn’t have any. Once the dough the dough has finished rising, you are ready to roll it out. Rather than make a very large cheese boat, I divided the dough in half to make two medium-sized cheese boats. Regardless, take the amount of dough you want to use, and roll it into the shape of a football (American football, not soccer football). 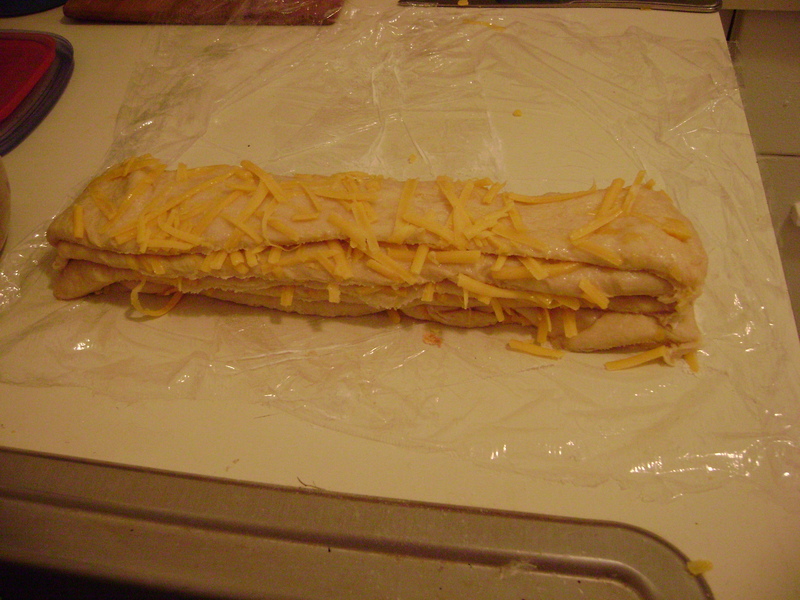 Place the cheese filling in the middle. Fold the edges of the dough over the filling so it looks like a boat. Bake in the oven at 400 for 15-20 min. you can add a raw egg to mix in at this point or not. I didn’t because only so much artery-clogging I can do in one recipe. Eat it while it is still warm. The cheese was less goopy than its supposed to be, but I was totally ok with that. You can eat it by itself, or, do what I did, which is eat it with slices of tomato, and a glass of riesling. I know, riesling is usually considered the ankle tattoo of wines. But – it’s not always sickeningly sweet – you can get really good medium-dry rieslings, which I am quite fond of. Regardless, if you like cheese and bread, try khachapuri – it is truly amazing. Well, not actually all the flavors of fall. There are no apples or halloween candy in this dish. But headlines don’t need to be 100% factually accurate (at least that’s what I’ve learned from years of reading the news) so yeah fall turnovers. Sometimes, my dishes aren’t actually inspired by a holiday or a story. I searched my trusty Greens cookbook, saw butternut squash turnovers and was like “sold!” Although I did make this recipe while dancing around my kitchen listening to Beyonce (yes, even I listen to that sometimes). Part 1: Pastry dough. You kind of want to make this earlier than later, because then the butter will get all streaky and incorporated into the dough better. Pastry crust is flour, salt, butter, and water, in varying amounts. Usually I go for a rough 3:1 rule. Three times as much flour and butter. Pinch of salt. Cut flour into flour/salt mix. You can use a fork, but a pastry cutter is way easier. Add water slowly until the dough comes together. But this is a rough approximation, and if you are a pastry dough novice – find a solid recipe you trust and try that first. There are a million different ways of making pastry crust, but the two most important tips are: add enough butter so that the dough can almost stick together without the addition of water. The other is add water a little bit at a time so that you add only just enough to combine. Too much water ruins dough. Be careful with water! Set aside till the filling is done. Part 2: The Filling. The original recipe was just called for butternut squash and seasonings, but I had some wilting kale that was in the “use it or dump it” phase of existence. So I used it. Chop the butternut squash into chunks, coat with salt, pepper and olive oil. Roast at 400 til tender. 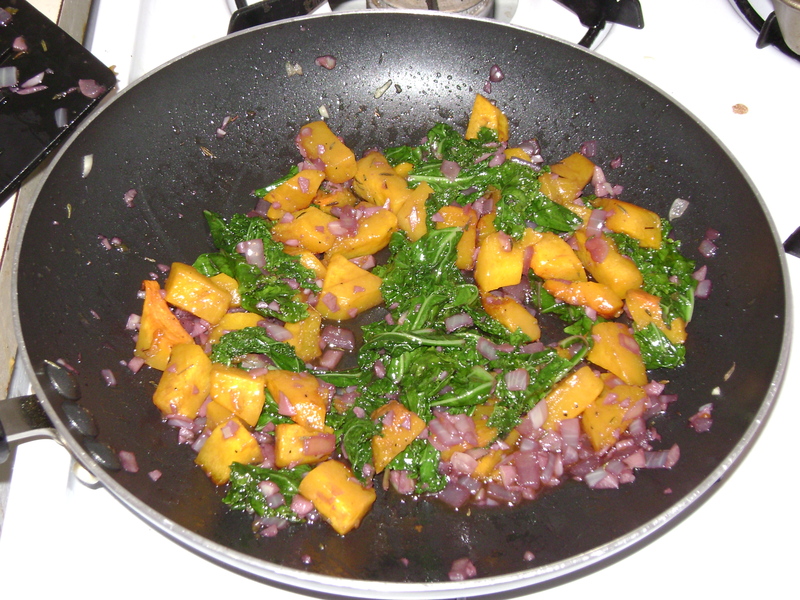 While the squash is roasting, saute diced (as in smaller than chopped) onions and garlic in olive oil. Add kale and saute for a while. Add a bit of wine and some dried thyme and continue cooking until most of the liquid has cooked off and the kale is done. Now, the recipe called for white wine, but I already had a bottle of red open, so I used that instead – it turned the onions and garlic into a pretty pink color! Add the roasted squash and mix it all together. The pretty fall colored filling! Part 3: Assemble and Bake. Divide your dough into balls, and roll them out into rough circles. My old roommate accidentally acquired my rolling pin and never gave it back. Two years later I still haven’t bought a new one. But you can use a wine bottle instead if you don’t have a rolling pin. Put some filling on one side, and seal them. If the turnover won’t close, add a little bit of water to the edges to help. Place finished turnovers (they should be shaped like a half moon) and bake at 400 until the dough is light brown. Part 4: Eat! Enjoy with a glass of that wine you just cooked with, or really whatever. 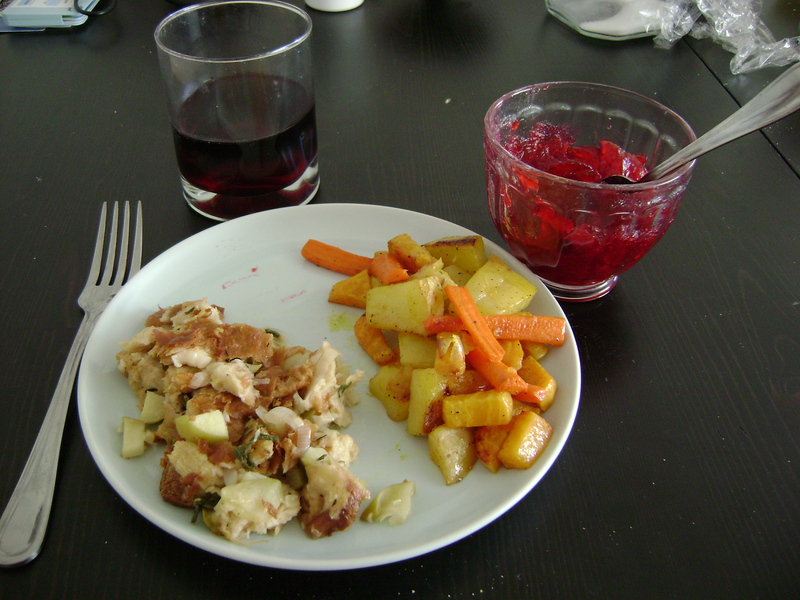 The nice thing is that these are a fairly completely meal all by themselves, so you don’t really need too much else. Makes it a great lunch to pack for work as a result. 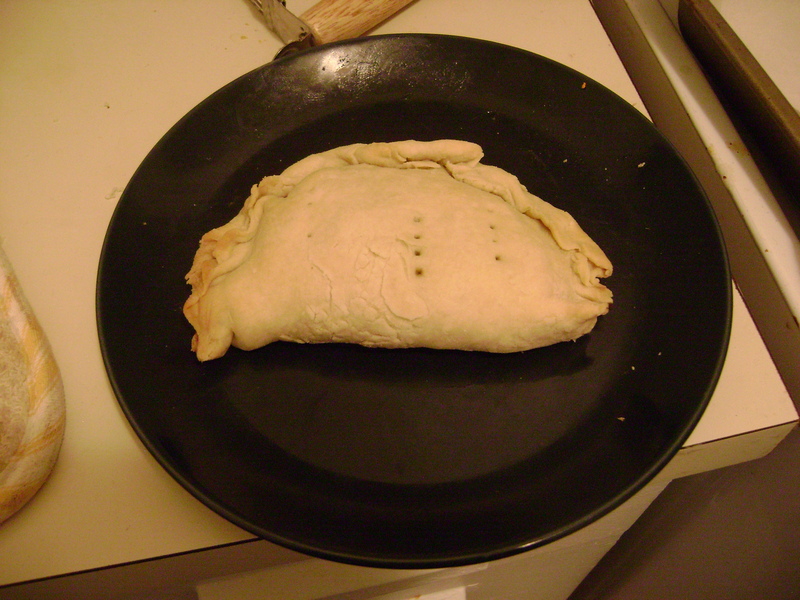 Also – the pastry crust will be less flaky if you reheat it in a microwave. One of my coworkers swears by his toaster oven. I don’t have the counter-space to buy one, so I just reheat in the microwave anyways. The second I saw this recipe I knew I had to try it. 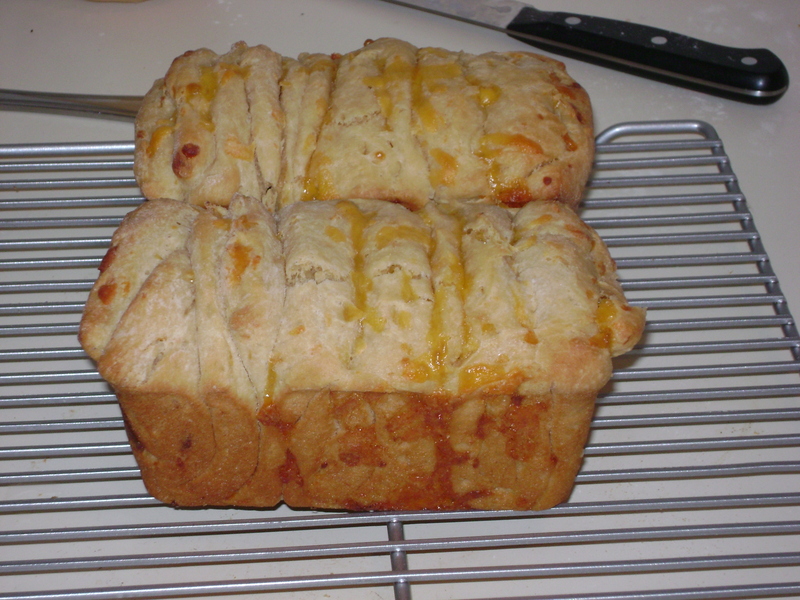 I enjoy making yeast breads, and have had great success making cheesy biscuits. But cheese bread? Absolutely necessary. But like happens, and a balance of healthy and unhealthy foods needs to be achieved, so it took a few weeks before I put plan into action. But I finally did, and the result was both glorious and addictive. In a large mixing bowl, combine the flours, sugar, salt and yeast, and stir to mix. In a small saucepan heat milk and 2 tablespoons of butter over low heat until butter is just melted, then add water. Add milk mixture to the flour and stir to combine (either with dough hooks or a spoon). Add the egg and 3-4 ounces of the grated cheese. Knead (dough should be slightly sticky) and let rise for 1 hour. It is important to use sharp cheese – cheddar or something else strong. Cooking cheese mellows it out, so if you want the cheese flavor to come through, make sure you start with a fairly intense cheese. The assembly is the only part that sounded tricky to me, but its easy. Roll out with dough into a large rectangle/square thing. The exact size and shape doesn’t really matter too much. Brush with butter, then sprinkle with cheese. Cut into strips, and layer them on top of each other. Than cut the giant pile into six square-ish pieces and stick them sideways in a loaf pan. See – easy. The result was amazingly delicious. It really was something I just kept eating, because a couple pieces was never enough. In theory you can pull apart this bread, and for the most part that was true. However, sometimes the pieces were a bit too large, and so they needed to be sliced in half. But that’s just me being nit-picky. I just ate the bread with butter, but it would probably taste good with jam, or apples too.